growing discontent with American political leadership throughout the late 1960s and early 1970s vastly accelerated with the unfolding of the Watergate scandal and the fall of a U.S. president in 1974. 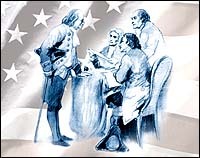 Events and circumstances of the era are now recorded as permanent testimony to the importance of a peoples right to know about their government. That right extends from access to the decision-making processes to learning when renegade officials or agents, instead of serving the people, are working against them. One of the most important advances to come of the period was the strengthening in 1974 of the Freedom of Information Act (FOIA), originally authored by U.S. Representative John Moss in 1966. The FOIA has since become an international model for government access. Its use has improved government and made a safer future for all citizens. Throughout its history, Freedom has been a tireless champion of the Act and one of the uncontested leaders in its use in public service journalism. While consistently using the FOIA for its own investigations, which in many cases spurred reforms, Freedom has also educated others on the law and encouraged its use as a means to ensure their government serves the public good. To this end, Freedom has published stories over the decades in which matters have been brought to light that affect the lives and livelihoods of government and citizens. The Freedom of Information Act was used to uncover the evidence that Ernest Hemingway was shadowed by FBI agents, on orders from J. Edgar Hoover, until his death. One of the most illustrative stories in recent American history on the importance of the right to know evolved through documents obtained under the FOIA from the Federal Bureau of Investigation. Under J. Edgar Hoover, renegade FBI agents and officials worked directly against the best interests of the public. Hoovers notorious counter intelligence programabbreviated Cointelprohas since become synonymous with government dirty tricks and treachery. The purpose of the program was to subvert groups and individuals perceived as threats to domestic security. Tools employed by agents and informers included black bag jobs, infiltration, mail covers, evidence and witness tampering, and the insidious use of rumor and false reports to destroy individuals reputations and careers. In pioneering the use of the FOIA, Freedom revealed how the tentacles of Cointelpro reached into the private lives of individuals targeted by J. Edgar Hoover. On November 30, 1960, Ernest Hemingway checked into the Mayo Clinic in Rochester, Minnesota, at the recommendation of a New York psychiatrist. The Nobel Prize winner had been encouraged by friends to see the psychiatrist, principally because the author complained that feds were following him. As it turned out, Hemingway was right. 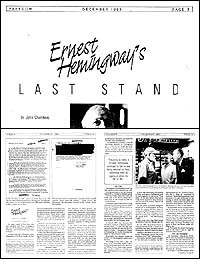 Documents obtained by Freedom in 1984 in response to a FOIA request showed that Hemingway was being followed and harangued by FBI agents, acting under orders from J. Edgar Hoover himself. As pieced together through heavily redacted documents, the agency targeted Hemingway as a communist sympathizer based on friendships and acquaintances he developed during the years he lived outside Havana, Cuba. Hemingway assisted the United States with intelligence activities in the early 1940s following Batistas rise to power, until the FBI soured on the author and considered him a threat. During the 1950s, the FBI learned that Hemingway planned to write a book about his experiences with the agency. FBI memos revealed a deep-seated animosity and fear, particularly on the part of Hoover, that the renowned author would damage the agencys reputation if he were to publish such a book. Thus, Hemingway was followed and monitored continuallyeven when he traveled overseas. After being encouraged to check into the Mayo clinic, the author was subjected to a series of brutal electric shock treatments which destroyed his ability to write. Mentally, physically and spiritually devastated, Ernest Hemingway took his own life in 1961, days after returning home from the clinic. To share acquired expertise of using the Freedom of Information Act, in 1979 and again in 1989, the editors of Freedom prepared a guide to understanding and using the Act which has been broadly distributed as a public service to tens of thousands of individuals and groups. Other FOIA documents published in Freedom told of a similar outcome for American actress Jean Seberg, another target of a malicious Cointelpro campaign. Seberg, rumored to have had an extra-marital affair and become pregnant, fought an unsuccessful battle to absolve herself of the false reports. Her marriage and career destroyed, she took her own life. Using the Freedom of Information Act, Freedom has investigated and published a wide range of stories pertaining to other governmental agencies including the CIA, intelligence divisions of the military services, and the Internal Revenue Service. Freedoms purpose for investigating the darker side of American government history is not to expose for exposures sake. Because of the FOIA, public awareness and responsibility for government has been raised. Moreover, increased self-policing within the government has resulted in a system equal to none in representing the public interest. Freedom has also used the Freedom of Information Act to investigate enigmatic events which were never solved in the day by day, hard news accounts of their passing. Two decades ago, the world was stunned by the news of 900 deaths at Jonestown in Guyana. Quickly dubbed a mass suicide of members and leaders of the Peoples Temple congregation, the name Jonestown became synonymous with cult. For years the tragedy served as the touchstone of such groups as the Cult Awareness Network in their efforts to instigate draconian measures against minority religious groups. Time healed the shock of Jonestown, but facts and evidence about it settled into conflicting and disturbing patterns. Documents, accounts of witnesses and survivors, testimony of medical doctors and informed analyses by experts all invited more questions than they answered. In the early 1980s, Freedom started filing requests under the FOIA with different U.S. agencies, seeking material that could help piece together the truth about Jonestown. Nearly 15 years and multiple requests later, Freedom unlocked doors and opened a floodgate: 39,000 pages of documents, never before seen outside government offices, were released. Analysis of the tens of thousands of papers revealed a picture fundamentally contrary to the widely reported perception of Peoples Temple: A congregation well within the mainstreamsupported by high-profile political and civic figuresand its leader, Jim Jones, a respected minister of the Disciples of Christ, a Protestant faith of millions of Americans. The papers also reveal a disturbing pattern of surveillance and infiltration taken against the Peoples Temple which particularly intensified when the group moved to Guyana. Corroborating interviews and research indicate that Jonestown was not a mass suicide but a far more sinister, complex and unsolved story. Freedom published its findings to date in late 1997 and is continuing its investigation. Freedom has prominently covered issues of freedom of information and the public right to access government files since the early 1970s. To share the acquired expertise of using the FOIA, in 1979 and again in 1989, the editors of Freedom prepared How to Use the Freedom of Information Act, a 46-page guide to understanding and using the Act. The publication was broadly distributed as a public service to tens of thousands of individuals and groups, causing a resurgence in use of the FOIA. In addition to explaining the purpose of the Act and giving an overview of how it works, the handbook described how to write request and appeal letters. Freedom has also produced or contributed to a host of publications since the 1970s which involved documents obtained under the Freedom of Information Act, including The Mind Control Papers, several publications on Cointelpro, and publications concerning abuses of citizens by the Internal Revenue Service and other agencies. The real security of a nation is the intelligence and understanding of its people. Every effort should be made by governmentthe servant and not the masterto assure that maximum information be available to the people who are the ultimate power under the Constitution. U.S. Congressman John Moss  Freedom Human Rights Leadership Award Winner, 1989.